I’m building to please my wife…thus: “BIG”. Frankly I don’t know if it can be afforded, HER way. All I can do to get to town anymore…let alone get to the property AND HAVE the materials needed. (Looks rather bleak). Still, DO have whats needed to TENT (cover) it…IF and WHEN I can get back up there. Meachelle (“M”) does like what I’ve done with “Sky’s Dome”. Sees it as a SPARE Liveable “home”. At $450.00. (the amount to get / stay a week / return and refill the Pick Up)…it’s DONE (but clean-up). Furnished and all. THAT is a LIVABLE ABODE Most CAN afford. Knowing her, shed pack it full of “must have” “STUFF”. 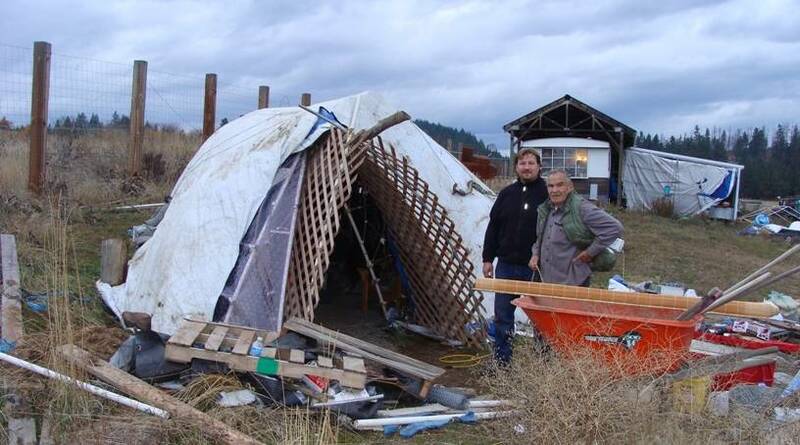 So…a simple dome (like Adams) that cost 10 CENTS, can hold THAT ‘crap’. Even one to hold Fire Wood. AHO. This ‘life’ is a KISS doing. Even the “small ones” CAN BE MADE BY 10 YR OLDS (under adult supervision)! In my three minis, we have Electric via an extension cord to the house. This, for HER. I can do quite well without. ANYTIME YOU “NEED” ELECTRIC, be it from On Line to a Generator / etc., YOU FACE BREAKDOWNS AND FUEL, etc., Problems. MORE MONEY as we ADVANCE” INTO “THIS TIME”. Friends, this is NOT yesterday…it’s NOW time..AND WILL GET WORSE! There WILL be a “Yesterday” “come back”. This will give people a FALSE sense of “security”. Yet will be only a TEMPORARY “breather”. OK, a serious of Mini Domes verses Government Subsidized (tax $$) motel rooms, etc. THESE WILL BE ONLY FOR a LIMITED TIME. Eventually you’ll be Out on the Streets again. (7 to 10 years if you can). OR OWN! Posted on 20 August '12 by Living Documents, under Alternative Living, dome home, Hobbit Hut, Red Elk Speaks, Skydome, survival skills. No Comments. I too lack construction knowledge but NOT common Sense. I’ve three MINNY domes here, and still the still incomplete BIG one on our other property. That is 30 diameter INSIDE x 19 1/2 High. 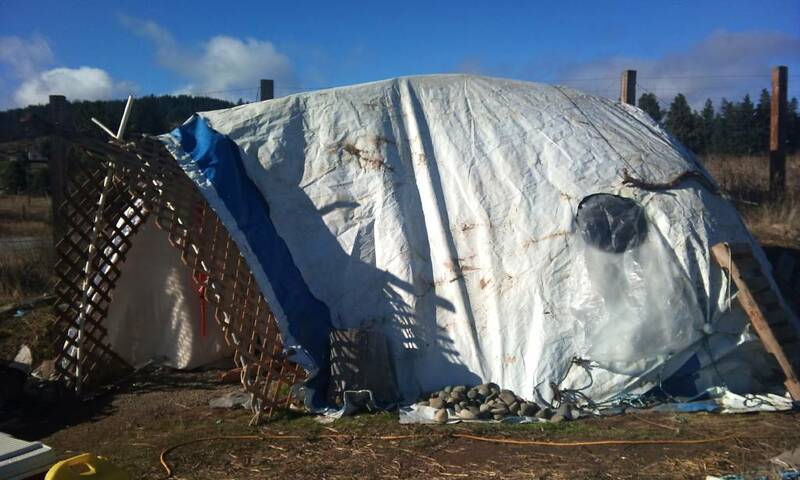 It’s a combo of Eskimo Igloo (long entryway overhang) / ONION shaped (but “cut” on the FLAT base (near center). A Loft with Bed Room there AND below it. “2 bedrooms” this way. A flat topped Wood stove for heat and cooking In the CENTER. Seating with Storage around all but Bedroom and Doorway. One BIG off-shaped (gnome) widow and on 1/2 the BIG doorway (again; Gnome odd-ball shape). As you enter the Half Door you can turn left (via the OPEN half of full door…this to the Bathroom…n to the kitchen Proper”. It has a storage shelf across the upper back. THIS part is a long DOG PEN RUN. Cyclone pen…6 ft tall. Exit door (#2) at far end. Cooking area at front side. U can cook there or at dome center one. All-in-All, the whole has Space Galore. Other the the dome sections roundness being broken up by the small bed.rm. All else there wide open (less stove). Guests can sleep on the storage seats or floor. 5? 6-7?. 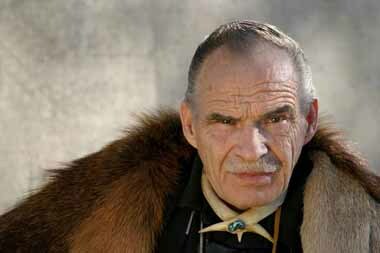 Built like a Sweat Lodge (Plains style). 3 pvc piping incinerated these up-rights (which are gathered towards wards the top). “Tied” together at the studs via Zip Locks and brass wires. I held the framing up with a nailed together 2×4 with “cross” board near the top. Then rolled on CHICKEN WIRE over the whole DOME part and locked this onto all the framing. Once that was done I then kicked loose the 2×4 “holder”. As expected (and HOPED) the whole dome SHRANK DOWNWARD n EXPANDED OUTWARD. Tightening the whole into a STRONG Structure! The dome measurements were AFTER this support “kick”. Aho? (The BASE Diameter remained the same). Thus it has an “onion-like”shape (but NOT severe). Rather attractive, to be honest. The dog pen was a ‘kick’ to do. 10×20. Done in about an hour by my (then) 14 year old grandson and myself. Once the fencing was all connected we simply took at end each, picked it up and placed it where we wanted it. With a slight “bend “between and side and backside of the dome. This left a “gap”. More pvc framing and wire filling that gap and allowing plenty of room for toilet / sink / TUB and a bit of cabinet space. Not crowded, but still on the small side. Aho? We are looking toward a cement mixed with dirt flooring. Flat stones set in as part. White Sand to fill gaps and keep all “airy” and Light. IE; White sand Grouting. Aho ? By the way, I may raise the LOFT Ladder to give more main floor room.. Swing up via a pulley and line. The Dog Pen section will have a SHED Roof…PLANTED with grass and flowers (Alaska Trapperson Style Cabin). Bending and BLENDING a Square to a Round (dome) side. Thus not look ‘out-of-place’ at all. Aho? At this time…less Cat Work, I’ve less then $1300.00 into this…INCLUDING A GIANT HEAVY WHITE TARP that will cover all. VINYL. Will then be a Fancy TENT till we can get proper material together to “permanent” it all. Also have rolls of thick insulation to put on before the tarp. With the stove we have all should be comfortable during are extreme winters there. (12 to 14 foot snowfalls). “CAT work” included a deep cut-in to hill side. This to cover with dirt. Only the Dog Pen will show its ‘shape’…and remember That TOO will have a Dirt Roof…planted. Aho? I’m one who likes to bring the OUTSIDE…IN. 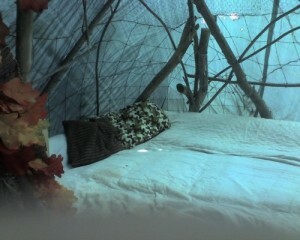 Go to “SHOESTRING CABIN” and see my 3 minny domes. This will give you an idea of what I mean. Its a HUB, by “Ghost”. Scroll down a bit to see ours. Also look up “THE GNOME HOME IN WALES”. This gave my wife the ‘push’ I needed to do the big one. So, basically, by more salvage and thinking Out-Side-The-Box, our MOVE TO Dome shouldn’t cost us more then 5 to 6,000.00. It’s a long way from complete. So far from our house here the gas is prohibitive. Went up twice to work on it. Planned a 1 wk per ‘doing’. LIGHTNING STORMS EACH WEEK…Day AND Night. Had to call it a useless trip and come home. Basically most was me doing. 3 times my grandson came and helped. Once 3 others as well. Its set there, framed and cover ready, for 4 + yrs now. Standing firm and ready throughout the winters/ Etc. To date, I’m quit pleased. Aho? Posted on 18 August '12 by Living Documents, under dome home, Gnome Home, Hobbit Hut, Red Elk Speaks, Skydome, survival skills, Tellings. 5 Comments. Here’s a ‘goody’ that may interest a number : type in (search) WATERBOXX (2 Xs). Rather fascinating Grow Plants / TREES “way”. Not only that, but Side Bar related info a WORTHY look too. One on Homes from Living Trees. Something I’ve done in the ’60s. Still there as far as I know. Made from growing bent willows. Made it for Christy as her own ‘private cabin In The Woods’. Even given thought to doing “ditto” on our safe land…using very tall White Birch trees in a grove there. Anyway, check these places out if you’re interested. Remember, Willows and willow-related trees (Birch being one) means : SURFACE WATER. Posted on 30 December '10 by Whale Sister, under dome home, Gnome Home, Hobbit Hut, Skydome, survival skills. 2 Comments. Make Winter a Time to LEARN! Most across the USA are snowed in….or, in general, in Cold. Wanna see what YOU CAN DO if “homeless”? Now’s a GREAT TIME to go BACK YARD CAMPING! Yup, with a tent (or tarp). A big bundle of Fire Wood….Sleeping bag or several Blankets. In short : GO TRY IT! The house is but yards away. You won’t die if “too much” for you. A GREAT Time to PRACTICE! Sky likes to put a “footprint” (cover on the ground and tent set up there, ON IT). Then put a tarp over the whole (tent is only for 3 seasons). Once couldn’t get his fire going…so STILL Camped, WITHOUT Fire. There have been a couple of times he a buddy(s) slept in one dome. TO “MUCH” FOR THE FRIEND(s)! So ended up coming in. SKY did NOT want too. If it wasn’t for his buddy(s) “crying” he would have stayed out. Like I said : “Guts”. The “safety” of a warm house just yards away helps “newbies”. Nothing to cringe about “running”. At least you’ll get a TASTE of HOW PREPARED YOU ARE! Best to find out NOW, than when Suddenly FORCED too! With even this SLIGHT try….it can sure give you Insight! Posted on 29 December '10 by Whale Sister, under Alternative Living, dome home, Family, Gnome Home, Hobbit Hut, Medicine Man, Red Elk Speaks, Skydome, survival skills. No Comments. All That Insulation, Just Falling From the Sky! Beautiful out. Going to “broom off” the domes and shovel snow off porch. 14 to maybe 16 inches and still coming down. “Brooming” is using a broom to push upward from inside. Did this when in my TiPi. All snows fall to base and goes up-ward. INSULATING the whole. FAR WARMER inside, then. LOVE IT! The whites kept their roof nails sticking above the shingles, to CATCH snow. Today we put out Big Bucks to insulate the daylights in the attic. Just another way to make someone rich. Aho? The common man is so STUPID (in my eyes). Folks, why FIGHT winter? USE IT and be COMPATABLE with it. Aho? Gonna get our snowshoes out and take Sky for a Walk-About. Get him used to these. If any are interested, I’ve owned / used a number of styles. I WON’T USE BUT THE “OJIBWAY” STYLE now. FANTASTIC “All Around” design. IVENS SNOWSHOE Co. is where I get ours (3 or 4 pairs). Decided best to make Tire Rubber “Chaps” instead of full Mukluks. High enough to strap above the knees. LESS SWEAT PROBLEMS. Aho? Also got out my Converted Water Ski. LOVE THIS like you wouldn’t believe! I took off the skeg and foot “step-in”. Screwed in good metal “eyes” at top sides. Drilled a hole at tip (pull rope) AND the BACK. I load this with my winter camping gear (AND Fire Wood). Keeping the load VERY low. Try to go 10 inches high. Never above 16 inches. Use the “eyes” to crisscross rope over the load. This sled FOLLOWS LIKE A PUPPY! My NA Ancestors did this. Theirs tho were often 20 ft. long. Steam Bent the tip. Glides behind like a breeze. 10 to 15 inch width. THIN single board. UNDULATE as you go along….”fitting” the contour of the land. Aho? Bought my ski at a ‘cheap shop’. $5.00. “Eyes” another $4.00. Used a Like Ski to make a DOG SLED. Used an old Lawn Mower Handle. Ran Cocker Spaniels with our daughter aboard. Gave it to a ‘cheap shop’ after I got malamutes and a freight sled. THEY SOLD IT IN 4 DAYS! $25.00 !!! I’ve taught a number how to make DOG HARNESSES out of old jeans. Each leg does one dog. This “doing” from the way the Eskimo in Greenland did, long ago. Other then having CRAZY coast livers pass by (freeway)…Winter CAN BE FUN! Posted on 22 November '10 by Whale Sister, under Alternative Living, dome home, Gnome Home, Hobbit Hut, Skydome, survival skills, Tellings. 1 Comment. Saw the new pics today. Wonderful. How in the world did you do that entry way? What is that? Can’t quite make it out in the photo? Boy, is that place looking sharp or what?!!!!! That entry EXTENSION are 2 LATTICE “Wind Breaks” any can buy at lumber yards and many bigger “all around” stores (Costco / Bi-Mart / Fred Myers / Etc. I got those at Habitat For Humanity ($4.00 for 2 big ones (those) and 2 smaller ones. 8 ft. long by 5 ft. high. Just turned on end and bent ‘em over a bit to create a better “gnome” entry. To the right side (inside) is a large space I call “the mud room.” Simply a place to leave your boots / etc. there and not mess the floor inside. There is a larg(ish) opening there, next to the right side of the main doorway. That allows even more light inside. Will cover that in clear Shower Curtain plastic. At the top of both lattices I have a thick branch connecting the two at the top. (This not well defined in the photo). Bent at the top outside end. Looks good and adds an “outdoorsy” (Gnome-Like) look. I intend to line outside with LARGE stones around the whole dome…then toss dirt berming from those, up. I’ve now got all I need to complete the inside (I THINK). Just a matter of doing, now. Putting on linseed oil on all wooden furniture / etc. 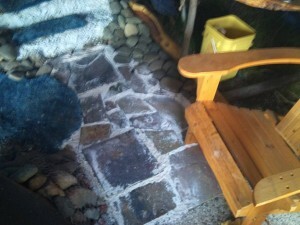 Spray paint the small round galvanized “shower tub”….seat the flagstone tiles and other general small things needed. Will add 1 shelf to the side and above the kitchen shelf…another at the head of the bed. In short, VERY close to done INside. Still to clean up OUTside and start rocking / berming. I will seed the berm with grass and wild flower seeds as I do this. This dome is DOUBLE Trenched. INSIDE along wall and OUTSIDE along wall. So, as you can tell, still much to do to be what I “see” as totally complete. The only thing I wish I had is a chimney through the top. Even with double insulated chimney pipe, it doesn’t stop the excessive heat that passes by. Melting my pvc pipe and willows that meet up there. So …. SMOKEY Inside when fire is started AND DYING. Between…FINE. Any similar done I will use the frame of an “Apartment Trampoline”. Setting the pvc and willows at its EDGE. Leaving plenty of space at the top there. Double Insulated Chimney will then be a safe option. Either do THAT or build up the frame like a giant inverted “funnel”. An African Hut “way”. Our BIG dome (other property) is on that “line”. Heat rises…and SMOKE is HEAT…the inverted “funnel” will catch this and guide the smoke out. Trapped and “guided” to smoke exit opening. Posted on 9 November '10 by Whale Sister, under Alternative Living, dome home, e-mail, Gnome Home, Hobbit Hut, Skydome, survival skills. 2 Comments. More work was done on Sky’s dome. This little dome home is really taking shape. The doorway was expanded and now has wind and snow protection. A second tarp was added to make the dome weather tight. There is more work needed to secure the tarp from blowing off but we used sand bags and rocks to hold it down for now. A hole was added to the new tarp so the side window is working. Some tile work was done on the in side. Posted on 9 November '10 by Whale Sister, under Alternative Living, dome home, Gnome Home, Hobbit Hut, Skydome, survival skills. No Comments. Think I don’t work? Dome work, then answered 2 snail mails and ONE HUNDRED and TWENTY SEVEN EMAILs AND 3 Needed runs to town. To top it all off…STILL have a Few HOURS before GOING TO BED…..Other Emails DUE! Oh, Don’t forget the PHONE CALLS! Them too. Posted on 7 November '10 by Whale Sister, under Alternative Living, Creator, e-mail, Gnome Home, Health Tips, Hobbit Hut, Humor, Letter, Medicine Man, Phone Call, Skydome, Spiritual Matters, survival skills, Tellings. 2 Comments. Day 1 At Last Is Here! The other parts are here. 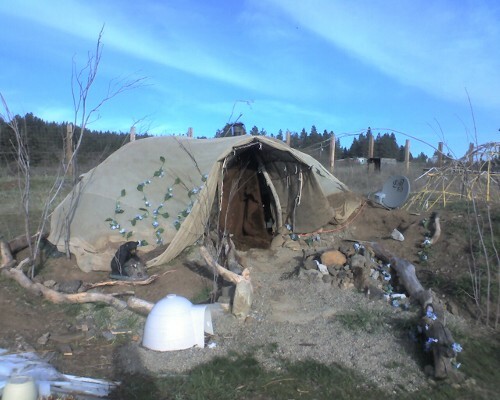 Posted on 6 November '10 by Whale Sister, under Alternative Living, Creator, dome home, Gnome Home, Hobbit Hut, Medicine Man, Prayers, prophecy, Red Elk Speaks, Skydome, Spiritual Matters, survival skills, Tellings, Video. No Comments. THIS REMINDS ME OF YOU. WOW! Red Elk, M and I just watched this YouTube video about a man who builds houses and teaches others…out of scraps, and other people’s throw aways. I got tears in my eyes and lump in my throat. It’s wonderful. You gotta see his “windows” made out of flat clear glass salad plates, and the broken mirrors, and broken tiles. YOU WILL LOVE THIS. You’re RIGHT ! Guy on the “right track”….in GIVING. May not be my “style” but CERTAINLY in my CORNER! Good to know Ghost and I are not alone. HO! Adam and Canada John are here. Will have THEM watch as well….then put this on my Blog 4 others to see. 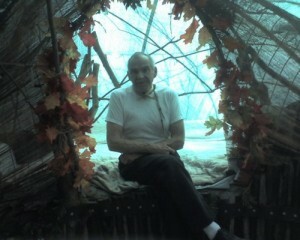 Posted on 6 November '10 by Living Documents, under dome home, e-mail, Gnome Home, Hobbit Hut, Skydome, Video. No Comments.